It is not everyday that I manage to join two of my main interests, mollusks and mythology. So rejoice!, for today is one of those days. I bid you welcome to the Cult of the Helix. So how was this cult born? Nature-worshipping barbarians coping in a dangerous environment? An old bearded guy receiving revelations in the desert? A bald hermit meditating in the mountains? Well, none of the above. 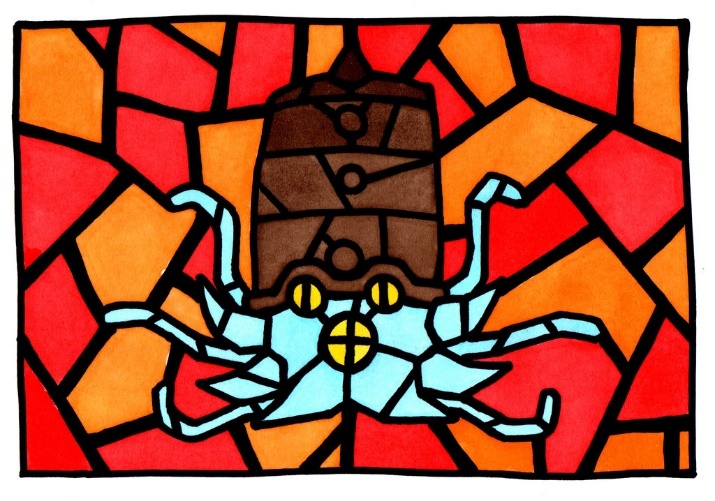 The Cult of the Helix was born in a most unorthodox manner: on the first iteration of Twitch Plays Pokémon. Wait, what? Twitch Plays Pokémon (henceforth “TPP”) was a crowdsourced event in which everyone could type commands through the website’s chat window and try to finish the game that was being streamed, namely Pokémon Red. It took a little more than two weeks for the players to complete the game and this was more than enough time for the birth of an entirely new religion. But how exactly did that happen? With thousands of people giving commands at the same time, there was a huge confusion and progress was very slow at the beginning. Then some programmer had the idea of initiating a system (named “Democracy Mode”) in which the game compiled votes every 10 seconds and the command inputted on the game was the one with most votes. People could vote to switch between Democracy and the original mode (hence renamed as “Anarchy Mode”) at any time. Most people preferred Anarchy, because it was supposedly more fun, and turned to Democracy only when it seemed otherwise impossible to advance in the game. TPP is a very boring way of playing Pokémon and the players soon turned to other stuff in order to make it a little more exciting. They started to interpret whatever was happening in the game in a way that it would make sense from a cosmic point of view. And, as a matter of fact, many bad things were happening in the game – in the Anarchic world of TPP, bad moves and poor strategies were running amok. Not intentionally, mind you, but as a result of the way in which commands were given and computed. This way, items were discarded, pokémons were released and, even worse, eevees turned into flareons. But let’s return to the Helix. One item in particular could not be discarded; it was the Helix Fossil (the fossilized shell of a ammonite-like pokémon). And, boy, people spent a lot of time in the inventory clicking on the Helix Fossil (and thus receiving in return the message “This isn’t the time to use that”). It did not take long for people to decide that the fossil was a god and that Red, the protagonist, was consulting it as a sort of oracle in order to discover the best way to proceed on his adventure. Lord Helix. Artwork by Chlorine17 (http://chlorine17.deviantart.com/). From this point onwards, the mythology of the Helix developed really fast. The Helix Fossil had been previously chosen by the players in spite of the Dome Fossil, which then became the Enemy, or the Devil, if you will. 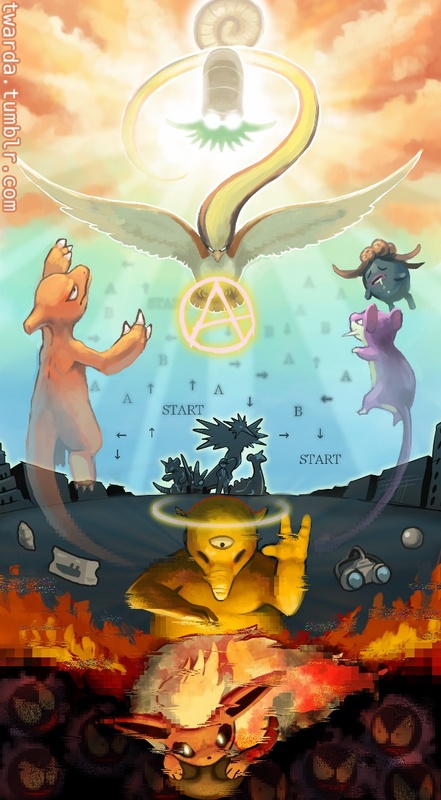 The Helix represented Anarchy Mode, while the Dome represented Democracy. The pidgeot, the most reliable pokémon in battle, became Bird Jesus; flareon became the False Prophet, a servant of the Dome Fossil; and many other pokémons received places in the mythology, accompanied by a lot of fanart on the internet. Long story short, eventually the players revived the fossil (yes, that’s possible in the game in a very Jurassic Park style) and received the pokémon omanyte in return. He was the resurrected god, Lord Helix. And then they went on to beat the game, but that’s not important – let’s take a closer look at the whole religion thing. The Church of the Helix was born in a very short time span and possibly already have more followers than many of the world’s “true” religions. In a sense, Helixism has itself become a true religion and, more than that, it was created consciously through the consensus of a tribe (here defined as a group of people sharing the same interests and symbols). This is perhaps an example of Durkheim’s totemism. According to him, this is the most fundamental and primitive style of religion. The totem (here, the Helix) is a reflection of the tribe’s consciousness, chosen as a symbol to represent it. Symbols are an important part of any religion and the main pillar of totemism. Symbols are the representation (or perhaps translation) of the abstract principles of a religion in material form and, thus, allow the cult to develop and flourish. Durkheim’s ideas were much disputed, of course (despite having received certain revival now in the light of research on the evolutionary roots of religious behavior), but the parallel was too strong to be ignored here. For Lévi-Strauss, for instance, the totem is a kind of animal with which a particular tribe identify themselves. In this case, it is not consciously chosen. Therefore, this view does not accommodate so nicely with the TPP’s Helix cult, since it was consciously (albeit somewhat accidently) chosen by its followers, which supposedly don’t identify themselves as an omanyte. Granted, there are yet further difficulties: to begin with, Helixism was not born “naturally”, like a totemic religion developing in a group of humans some tens of thousands years ago. Rather, it was in a large part built on the common features of Christianity (including its symbology and usual artistic depictions). This, of course, merely reflect the cultural background of most players, but make comparisons with theoretical works more complicate and perhaps even more tenuous. The Helix mythology. Artwork by Twarda8 (http://twarda8.deviantart.com/). Of course, this is not a serious foray into the origins of religions in general or the meaning of a peculiar newborn religion. These are just some random thoughts that came to me when I first saw the Helix cult in all its glory. Helixism will probably never be treated seriously by its followers (well, at least I hope so). Still, the Church of the Helix functioned in its own manner as a true religion does, giving an identity to a group, making them stick together and driving them forwards (there was even a petition to make March 1st the National Helix Day in the USA). As such, it is a unique and amazing event and I do hope that somebody will someday seriously study it. The Helix Fossil and the pokémons you get from it, omanyte and its evolved form omastar, are based on actual mollusks: the ammonites. Top row: the helix fossil (left) and omastar (right), as they appear in official Pokémon artwork. Bottom row: Asteroceras sp. (left), an actual fossil ammonite shell from the Jurassic of England, and an artistic reconstruction of the animal (right), by N. Tamura (http://ntamura.deviantart.com/). The ammonites are a completely extinct branch of cephalopod mollusks – besides ammonites, the class Cephalopoda comprises squids, octopuses, cuttlefish, nautiluses and the also extinct belemnites. Ammonites once ruled the seas and diversified in thousands upon thousands of species, but unfortunately, they died together with the dinosaurs in the great extinction event at the end of the Cretaceous. They received their name in ancient Rome, for the fossil shells were compared to the ram’s horns of the Egyptian god Ammon. 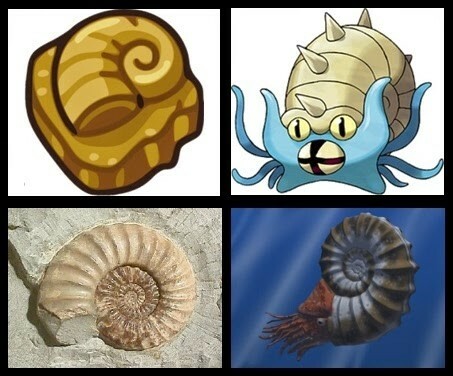 By the image above, one can see that both the fossil item and the pokémon are reasonably representative of ammonites (although the pokémon’s shell is positioned like a snail’s shell, not like a cephalopod’s!). But I do have an issue with the name: “helix” comes from the Greek, through Latin, and simply means “spiral”. Up to here, it is a fitting name. However, Helix (notice the italics) is already the name of a genus of land snails, which includes common garden snails and edible snails. 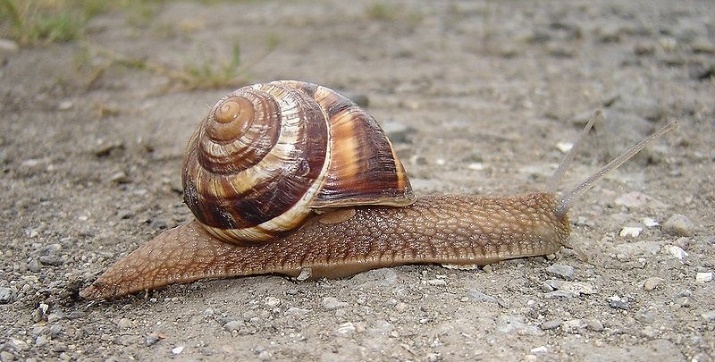 A Helix snail: Helix lucorum. Image taken from: Wikimedia Commons. Land snails are, of course, gastropods, which is an entirely different class of mollusks altogether and only distantly related to the cephalopods (and thus to ammonites). They could at least have chosen a better name; a good deal of ammonites have names ending in “ceras”, for instance (which means “horn” in Greek). But Pokémon is a complete failure for names – gastrodon is another poorly named molluscan pokémon. But I’ll let this whole name deal slide just this once, since this fossil has spawned the first mythology ever based around a mollusk – and that is truly something to be happy about. But since they have chosen the name Helix, I have a final comment to make (which may be somewhat disturbing for the faithful), for one must be consistent with his choices. “Helix” is feminine, so we would have a Lady Helix, not a Lord Helix. Unfortunately, pokémons still did not have genders in Pokémon Red (this feature was only introduced in the so called Generation II, i.e., the Gold/Silver games), so we will never know Helix’s gender for sure. In any case, I bet it would have been a surprise for the followers to discover that their god was actually a goddess. Last but not least, if you have any important questions, feel free to do like Red and consult the Helix Fossil, in this charming website: http://askhelixfossil.com/#313usi. I’d like to thank the artists from deviantArt.com, who kindly let me use their works here. Durkheim, E. (1912) The Elementary Forms of the Religious Life. George Allen & Unwin, London. Leach, E. (2010) The Structural Study of Myth and Totemism. Routledge, London. Lévi-Strauss, C. (1963) Totemism. Beacon Press, Boston. Mithen, S. (1999) Symbolism and the supernatural. In: Dunbar, R.; Knight, C.; Power, C. (Eds.) The Evolution of Culture: A Historical and Scientific Overview. Rutgers University Press, New Jersey. Pp. 147–172. Wade, N. (2009) The Faith Instinct: How Religion Evolved and Why It Endures. Penguin Press, London.